Progesterone is known as a "female hormone," since it plays a significant role in ovulation, pregnancy and fertility in women. What most men don't realize is that plasma levels of progesterone are surprisingly high in men and appear to play a significant role in male health. 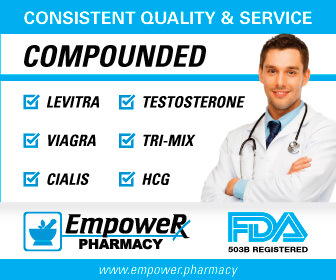 Surprisingly, it can also help some men in the bedroom and many alternative and anti-aging physicians are actually using progesterone to help cure erectile dysfunction and other male-related health issues, something I will discuss below. CAUTION: Progesterone should only be administered under the care of a knowledgeable physician. Not everyone feels good on progesterone. One man wrote that "I tried using a very small amount of progesterone cream but even the recommended small amount for men made me feel lousy the following morningm so I stopped using it after only a few days." In addition, please read my page on The Potential Dangers of Progesterone for additional important information. 2. Erectile Dysfunction Treatment. There are some anecdotal reports, admittedly from non-peer reviewed sources, that indicate that progesterone can be a near miraculous cure for some men with erectile dysfunction, especially when combined with HRT (testosterone therapy). I cover this in my page on Progesterone and Erectile Dysfunction. 3. Noradrenaline Control and Reduction. It looks progesterone can help control and even reduce noradrenaline. This stress hormone is known for being the "anti-erection" hormone in the sense that it actually provides necessary feedback from men getting spontaneous erections. However, too much noradrenaline puts the brakes on one's hardness factor. NOTE: Are you high or low in progesterone? You can find out yourself through one of these Testosterone and Hormone Labs. 4. High Blood Pressure. Progesterone, likely from the effects of #2, can improve blood pressure a little in men and, of course, hypertension is one of the leading risk factors for erectile dysfunction. For more information, see this link on High Blood Pressure and Erectile Dysfunction. 5. Sleep Improvement. Progesterone plays an important role in sleep and sleep quality. Some commentators believe this is progesterone's primary role, because Sleep is So Critical to Male Health. 6. Bone Mass. Some physicians insist that progesterone can increase bone mass in men with osteopenia and osteoporosis. Of course, estradiol is reponsible for healthy bones in both men and women and, often, you could look at progesterone as partnering with it and acting in similar ways. 7. Fertility. Sperm hyperactivation may not sound like a good thing, but it's actually important in order for the egg to be fertilized. Progresterone is actually one of the major factors responsible for this. You can get your levels checked at one of these Man Friendly Labs. 5) Gynecol Obstet Invest, 1993, 36:234 238, "Progesterone Reduces Sympathetic Tone without Changing Blood Pressure or Fluid Balance in Men"
6) Br Med J (Clin Res Ed), 1985 Jan 5, 290(6461):13 14. "Natural progesterone and antihypertensive action"
7) The Aging Male, 2004, Vol. 7(3):236-257, "Progesterone: the forgotten hormone in men?" 11) J Endocrinol. 1981 Jul;90(1):97-102, "Effects of testosterone, pregnenolone, progesterone and cortisol on pituitary and testicular function in male golden hamsters with gonadal atrophy induced by short photoperiods"
12) Fertility and Sterility, 1992, 58(6):1191-1198, "Direct effects of progesterone and antiprogesterone on human sperm hyperactivated motility and acrosome reaction"